Is Your Child Wearing the Right Size Shoes? I was out shopping and saw a GREAT deal on Kamik boots last spring for my boys. I was buying ahead and hoping they will fit, but it got me to thinking.....How many parents are putting their kid's in the wrong size shoes? So I thought I would give some shoe fitting tips. Of course the best thing to do is to have your child professionally fitted, but what if you're like me? What if you bought the shoes last spring and are checking to see if they still fit this year? Here are the tips to ensure your kids are in well fitted shoes. • Foot-care specialists roughly agree on the “thumbnail test”. While the child is standing in the shoes, use your thumbnail to push between the end of the longest toe (not necessarily the big toe) and the end of the shoe. If your thumb can't fit, the shoes are TOO SMALL! You can also use this for width (which is commonly overlooked) You should feel at least a 1/4-inch give in the shoe’s width when pushing your thumb down the outside of the shoe at the widest part of the foot. • Check the heel of the shoe. The child’s heel should not slip when walking. If it is too loose, your child’s foot will slide forward, crowding the toe and possibly causing blisters. • If the shoe style is low-cut, check that the ankle bones have a good fingers width away from the shoe. The bone on the outside is lower than the one on the inside of the ankle. • Be sure that the lace rows fit together evenly. Rows that are too wide or too narrow on either the top or bottom may indicate poor fit. • Check the foot for any signs of irritation, redness or blistering. You should check after wearing the first few hours and then again after a full day. 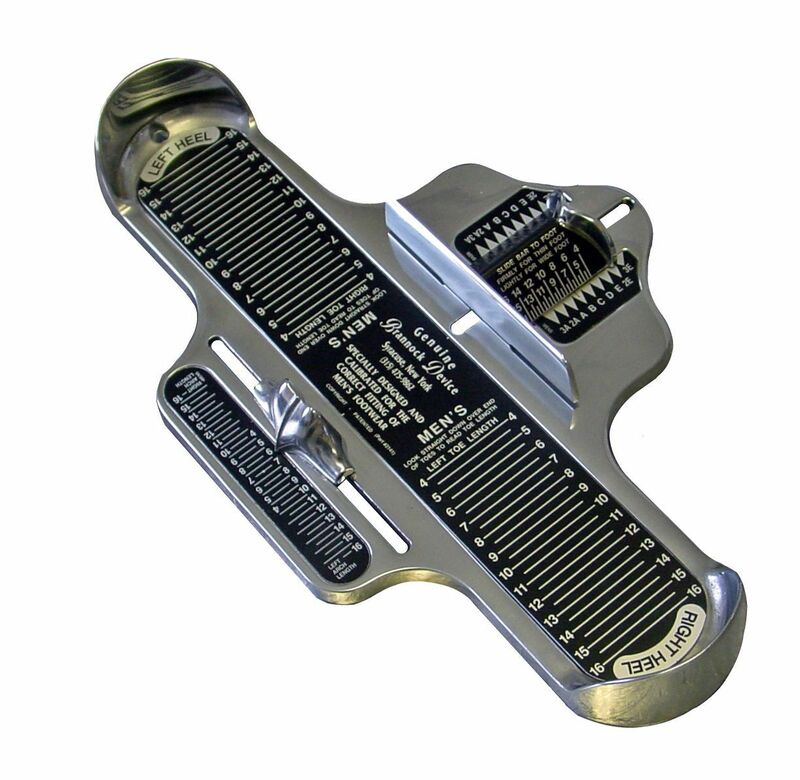 • Be sure both feet are sized with a Brannock device (foot-measuring tool) while your child is standing, NOT sitting. One foot may be larger than the other and you must fit to the larger foot. • Make sure the width is measured as well. Don't discount this, the width is equally as important as the length. It may mean you can't find shoes as readily but with so many retailers carrying wide and narrow it is much easier these days. • Shop in the afternoon as feet are a little more swollen and be sure your child wears their "normal" everyday socks. • Fight the urge to buy bigger shoes and trying to make them last. We all want to save money, but on your children's feet is not the place to do it. Finally be sure to check your child's shoes each season. Any child under the age of 10 will often outgrow their shoes quickly. If it goes unrecognized it can lead to blisters, ingrown nails, black nails, and other problems that us MOMS don't want to deal with. So be preventative!